Years ago, the television series “Life Goes On” portrayed a teenager named Corky who had Down syndrome. The starring role was played by a young man with Down syndrome, and many people were touched by his winsome performance. Critics raved. But many of the same critics favor the killing of these children, just like Corky, before they are born. When adults kill a handicapped child, preborn or born, they may think it’s for her or his good, to prevent future suffering. But in doing so, they aren’t preventing cruelty to the child; they’re committing cruelty to the child. And in reality, it’s most often done in order to prevent difficulties for themselves and others. I was touched by a video of Charlotte Fien, a British young woman who eloquently challenged a UN “expert” on human rights who advocates for aborting Down syndrome babies. Mr. Ben Achour, your comments about people with Down syndrome deeply offend me. I felt you attacked me for being who I am. Who am I, Mr. Ben Achour? I’m a human being just like you. Our only difference is an extra chromosome. My extra chromosome makes me far more tolerant than you, sir. . . . If any other heritable traits like skin color were used to eradicate a group of people the world would cry out. Why are you not crying out when people like me are being made extinct? What have WE done to make you want us to disappear? As far as I know my community doesn’t hate, discriminate, or commit crimes. . . . I keep hearing you use the word “suffering” in relation to Down syndrome. The ONLY thing we have to suffer are horrible people who want to make us extinct. I have a brilliant life. I have a family that loves me. I have great friends. I have an active social life. Mr. Ben Achour, what you are suggesting is eugenics. It’s disgusting and evil. You need to apologize for your horrible comments. You should also be removed from the Human Rights Committee as an expert. You are not an expert about Down syndrome. You sir, do not speak for my community. The Human Rights Committee needs people who will genuinely fight for the rights of others who are being oppressed. I suggest that the Human Rights Committee appoint me as an expert. I will fight for our right to exist for the rest of my life. Charlotte is joined by a chorus of courageous individuals with Down syndrome who are speaking out about their right to life. In her TEDx talk, my fellow Oregonian Karen Gaffney asked, “I have one more chromosome than you. So what?” An accomplished open-water swimmer, Karen has crossed the English Channel in a relay race and completed the swimming leg of the Escape from Alcatraz triathlon. “I don’t want to be aborted, I want to be born,” Natalie concluded, to applause. 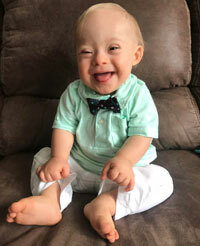 There is one recent positive sign in American society: Gerber named Lucas Warren, who has Down syndrome, as their 2018 Gerber Spokesbaby. 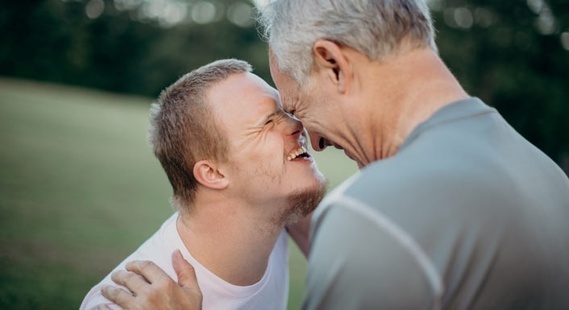 Looking at Lucas’s precious smile, how could there be any doubt that he and other children with Down syndrome have lives worth protecting and cherishing? Curtis Young, The Least of These (Chicago, IL: Moody Press, 1983), 118. Marc A. Thiessen, “When will we stop killing humans with Down syndrome?,” The Washington Post, March 8, 2018. Jevan, “People with Down Syndrome Are Happier than Normal People,” The Tribal Way (blog), October 2, 2012. H. Choi, M. Van Riper, and S. Thoyre, “Decision Making Following a Prenatal Diagnosis of Down Syndrome: An Integrative Review,” Journal of Midwifery and Women’s Health 57, no. 2 (March/April 2012): 156–164. Psalm 139:13-14 — For you created my inmost being; you knit me together in my mother’s womb. I praise you because I am fearfully and wonderfully made; your works are wonderful, I know that full well. Psalm 22:9-10 — You brought me out of the womb; you made me trust in you, even at my mother’s breast. From birth I was cast on you; from my mother’s womb you have been my God. O Lord God Almighty, who hast made us out of nothing, and redeemed us by the precious blood of thine only Son; preserve, I beseech thee, the work of thy hands, and defend both me and the tender fruit of my womb from all perils and evils. I beg of thee, for myself, thy grace, protection, and a happy delivery; and for my child, that thou wouldst preserve it for baptism, sanctify it for thyself, and make it thine forever. Through Jesus Christ, thy Son, our Lord. Amen.